"Currywurst is a popular 'fast food' in Berlin, Germany. It is quick and simple and everyone loves it! If you're in a hurry, you can substitute ketchup for the sauce, or use your own recipe." Pour tomato sauce into a large saucepan, then stir in the chili sauce, onion salt, sugar and pepper. Let simmer over medium heat, occasionally stirring; bring to a gentle boil and reduce heat to low. Simmer another 5 minutes. Meanwhile, broil/grill kielbasa sausage for 3 to 4 minutes each side, or until cooked through. Slice into pieces 1/4 inch to 1/2 inch thick. Pour tomato sauce mixture over sausage, then sprinkle all with paprika and curry powder and serve. See how to make traditional vinegar-based potato salad with crumbled bacon. 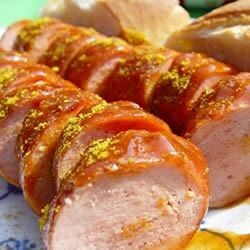 in germany this recipe is made with kockwurst, also we use a lot more curry, hence "currywurst", it is served with fresh broetchen (something like a hard roll) which is dipped in the sauce. Try a knockwurst instead of the kielbasa. (kielbasa is Polish not German). Knockwurst is more like the original Currywurst from Berlin. This was good, and very quick. The only thing that I didn't like about it was how much sauce was wasted. I will cut the sauce recipe by half, at least, next time.